JAMMU, Sept 2: Impres-sive religious processions (Jhankies) were taken out at Poonch, Kathua, Sunderbani, Mendhar and various others places in the region in connection with the Shri Krishan Janmashtami today. 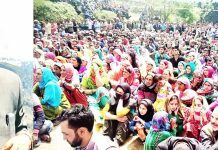 A large Shobha Yatra was taken out in the border town of Poonch where people from at least a dozen adjoining villages including Ajot, Degwar, Jhulas, Golpur, Dundak etc participated. They came along with decorated chariot, chanting religious slogans at Geeta Bhawan Poonch and from there an impressive Shobha Yatra started. A large number of women and children also participated in the Shobha Yatra. 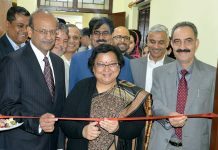 District Administration and local legislators also joined religious procession, which after passing through various markets of the town finally culminated at Geeta Bhawan. The devotees were chanting slogans in the praise of Lord Krishna. An elaborated security arrangements had been done by the local administration for the smooth conduct of Shobha Yatra. In Mendhar town also, a large religious procession was taken out from Hanuman Mandir. It passed through main market and entire town and finally culminated at the same place. The SDM and SDPO were also accompanying the Shobha Yatra. 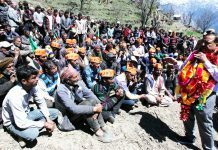 There was strong resentment among the minority community members as there was no cleanliness along the yatra route and in the entire town on the festive occasion. 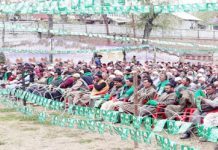 Another Shobha Yatra was taken out at Sunderbani town of district Rajouri this evening, which was attended by a large number of people. The organisers had decorated a chariot where Lord Krishna as child had been mounted with his father, Vasudeva. The local artists performed Krishan Leela. 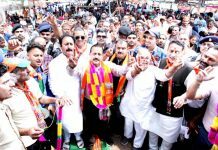 In Kathua town also a large Shobha Yatra was taken out by the SD Sabha and other Hindu organisations to mark Shri Krishan Janmashtami today. The people celebrated the occasion with great religious fervor and gaiety. 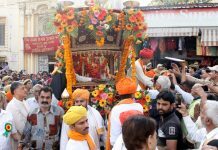 The Shobha Yatra was taken out from Maha Kaleshwar temple under the temple committee and after passing through Krishna Nagar and various markets, culminated at the same place. The devotees were chanting religious slogans and devotional songs during Shobha yatra. In Jammu city also similar Shobha Yatra was taken out from Radha Krishan Temple New Plot to Prem Nagar, Jawahar Nagar, Tali Morh, Sarwal and Rehari. A large number of women and children also participated. To commemorate Janmash-tami, two days function commenced at Shiv Shakti Mandir, Sector-1, Pamposh Colony, Janipur, today. 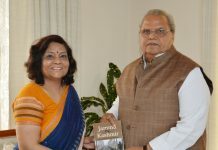 The function is being organized by Shiv Shakti Mandir Sanastha under the supervision of president JL Bamzai and Vedic Guru Jai Krishen Khar, General Secretary for the betterment of the Hindu community, world peace and life long members of the Sanstha. A large number of people including women and children from different walks of life congregate in Mandir Complex to participate in the Janmashtami celebrations. 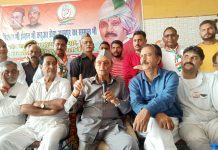 While speaking on the occasion, JL Bamzai, president of Shiv Shakti Mandir Sanstha and Vedic Guru Jai Krishen Khar, general secretary asked the devotees to maintain communal harmony and brotherhood. At Saraswati Vihar Jammu also a Shobha Yatra was taken out from local temple. 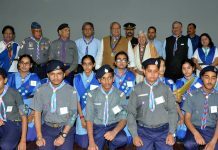 Modern Academy Talab Khatika, Jammu celebrated the festival with great enthusiasm. Students presented impressive cultural program. 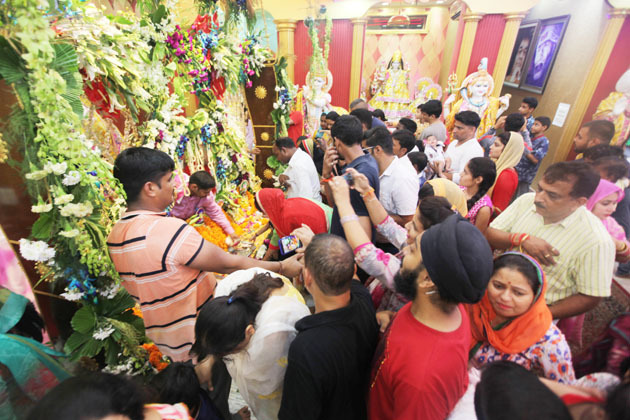 The Krishan Janmashtami was also celebrated at Tirath Raj Mattan with religious fervor and gaiety today. Hundreds of devotees attended the function which was held at Nagbal Mattan. The devotees participated in Pooja -Archana of Lord Krishna. The function continued up to late in the night which was followed by serving of Prashad to devotees. In connection with Janmashtami festival an impressive Shoba Yatra was also taken out by employees of PM Package at Sheikhpora Migrant Camp in Budgam district today.